Galaxy Tab going to AT&T November 21 | Android Blast! 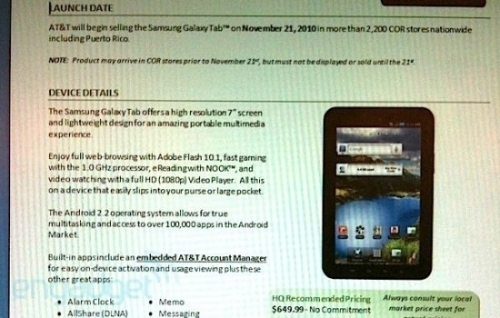 According to a leaked AT&T training document the Galaxy Tab will be released at AT&T on November 21. AT&T will offer the Android based tablet device for $649.99. Interestingly, Verizon and T-Mobile both offer the Galaxy Tab for $50 less, off contract. Why would AT&T offer it for $50 more? Perhaps they will drop the price shortly after launch? We'll see. Data plans will be the same as what AT&T offers iPad customers - 250MB for $14.99 per month or 2GB for $25 per month.